There is nothing to be done about the red numbers, but XRP investors know better than to fear. Did you buy at the top? If so, you are not alone. I know it's painful to see red numbers, especially if you bought in during the exuberance of the latest all time high for XRP. But it proves one thing; you believe in XRP's value. Never apologize for purchasing an investment that you believe is worthy of your hard-earned money. Yes, there's never a shortage of people that will tell you that you made a bad investment choice if you purchased at the all time high; they are mocking you because it makes them feel better about themselves temporarily. I'm a hodler. (For newbies, that's crypto-speak for somebody that holds their crypto investment rather than selling on a down-turn) I sat on my XRP stack and now wished I had more money to invest in XRP at the current prices. While I understood that even rallies of gargantuan size will end, I was of the opinion that we might have had enough momentum to break the $5 barrier. I guess I'll have to wait a little while for that? On Discord, I promised everybody that if XRP broke the $5 barrier, I would get a tattoo of the XRP symbol. Note that I didn't say where (on myself) or how big it would be, however. With those caveats in place, I'm hoping to keep my promise before we reach the end of February. XRP fans normally steer clear of negativity where we can in crypto, but it's almost impossible at times. When twitter accounts with massive followings spread misinformation, we have choices as a community on how to respond. As XRP continues to challenge Bitcoin for its dominance of the #1 spot, expect massive push-back from the financial interests behind Bitcoin and its proof-of-work cousins. Why? Because there are many wealthy individuals and groups that have made millions of dollars off of Bitcoin's outdated tech. Where is the FUD Coming From? Multiple new crypto-currencies like XRP have proven that wasteful mining is unnecessary to secure a cryptographic network, and yet if you listen to some people on twitter, it's as if they are blind to the fact that massive amounts of coal-generated electricity is currently being used to fuel miners in China. Some - not all - of these financial interests are now attacking XRP and Ripple. Most people, even most crypto-anarchists, do not believe that the "end justifies the means," because it violates the very ideals that they value. But those financial interests that are hiding behind crypto-anarchist slogans need to be brought out of the shadows of social media and exposed for what they are; opportunistic fear-mongers who didn't see well enough ahead of time to invest in XRP. An author at bitcoin.com named Kai Sedgwick put his name on an article that attempts to make readers believe that XRP is the first step in the government seizing their money and crypto. He used the term "freeze" multiple times to try and scare new investors away - or more precisely, to try and scare them into Bitcoin. It wasn't the first time that Kai has been called a liar in so many words using polite euphemisms. More than one person has had to resort to posting independent responses to try and repair the damage that he's done. Here's a recent example from less than two days ago on an entirely different piece: https://steemit.com/eosio/@thomasbcox/a-response-to-kai-sedgwick So why does bitcoin.com continue to publish his hit pieces on competing coins? Decide for yourself. The big news for xRapid adoption was the announcement of two additional banks to the list of RippleNet users; Siam Bank (Thailand) and Axis Bank (India). 2 The announcements quote Asheesh Birla confirming that both of the banks are currently using xCurrent. 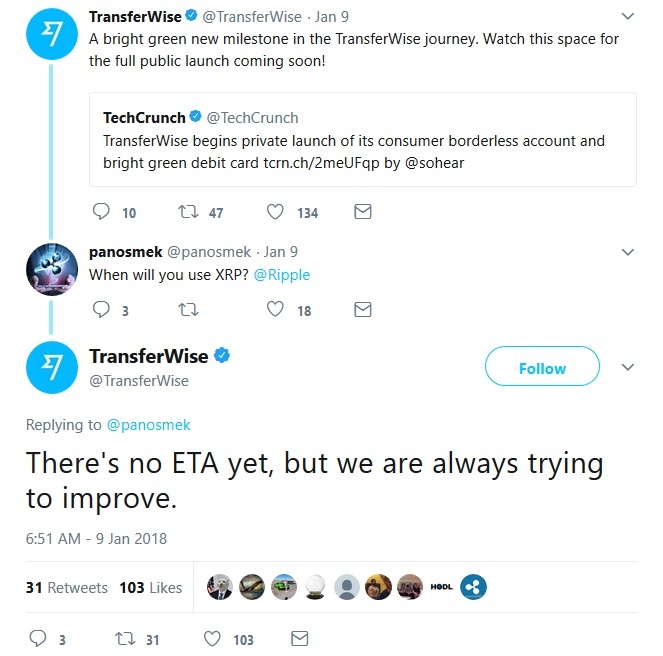 While xRapid wasn't mentioned in the corrected version of the article from Businessinsider (the original version said xRapid), even xCurrent integration is welcome news, and it's even more intriguing given that neither of these two banks constitute "household names" as some in the XRP community were expecting based on other rumors and communications from Ripple. To many, this indicates that further announcements are in the works, but have been delayed for one reason or another such as NDAs (Non-disclosure agreements). While a chance interaction at the Singapore Fintech Festival was auspicious, TechCrunch recently covered additional developments for TransferWise. On Tuesday of this week, TransferWise announced a revolutionary new product - a multi-currency bank account that can also have a debit card attached. Are they using Ripple in the background? Unknown. They might be leveraging improvements to their existing architecture, or they might be plugging into xCurrent's ability to move money seamlessly from one currency to another. Bottom line? We don't know for sure one way or the other, but the XRP community is looking for information as it presents itself. This purchase was not the only one - many large payments of XRP have been changing hands in the last few days; its apparent that many investors, exchanges, and possibly banks are purchasing this digital asset. The added demand for liquidity for these institutions indicates an accelerating demand for XRP. Exchanges have been making purchases of XRP in order to service liquidity needed for trading the digital asset. 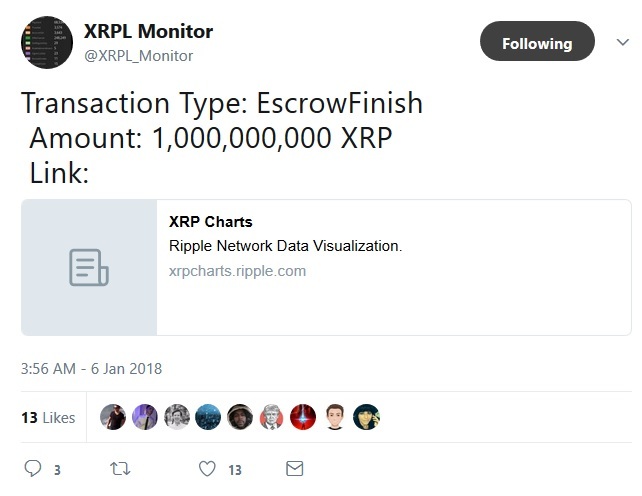 Almost all of the major exchanges have made substantial direct purchases of XRP in the past week alone, verified by the XRPL Monitor Twitter account. In addition to these liquidity purchases, new exchanges have been adding XRP all over the world in an effort to capture a slice of this growing market. "Upon its launch, DMM Bitcoin will only support seven hand-picked cryptocurrencies in bitcoin, Ethereum, NEM, Ripple, Litecoin, Ethereum Classic, and Bitcoin Cash"
How much more volume will be added to the top crypto choices as a result of DMM's listing? A lot. While South Korea has been able to drive crypto prices and volume for many months, its intriguing to now add Japan's large-volume exchanges to this mix. One of the metrics that is used for comparison of crypto networks is the number of wallets. 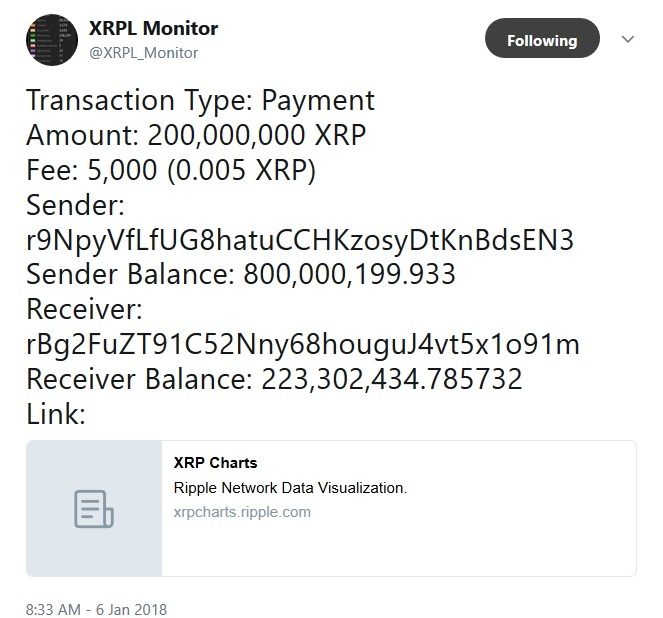 I've reported on these numbers in previous posts, and the XRP community actively tracks the statistics associated with wallets and their balances. 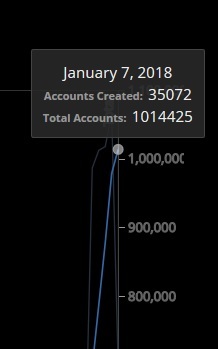 This landmark will make 2018 an easy year to gauge progress as we move forward and XRP takes center stage - will this number double in 2018? Triple? Time will tell. For those that are new to XRP or to crypto in general, it's good to augment your knowledge with a variety of sources, and one way to do that is to read articles and content on Reddit. While the "linking to content" is a great feature, there's also much to learn from some of the commentary that results after posting. I'm speaking first-hand based on my own experience, and I'll follow it up by pointing new users to one of the most well-read subreddits; r/Ripple. "...essentially a 1-page cold-wallet version of RippleTrade. Everything is client-side and nothing stored or processed by any servers other than the Ripple network." The website is impressive despite his humble description, and it contains all of the basic functionality expected from a wallet application. I recently used it to create a new token on the XRP Ledger - the HDR token. The origins of his greenpaper can be traced back to his conceptual post on XRPChat on June 27, 2017. 18 while GitHub may not contain much yet, he indicated as recently as January 8th that he aims to release more details - and code - soon. I've mentioned the XRP Tip Bot in previous blogs; it's a unique social media application that allows users to tip Reddit posters. The tipper simply gives the command "+1 /u/xrptipbot" on Reddit in any post, and the person they're replying to is the lucky recipient of one XRP. Was working on an "open source XRP Wallet app written in VueJS." This is exciting, because the XRP Tip Bot was (and is) very well-received on Reddit. Based on what I've seen so far, I'm anxious to see what his team creates. The recent glut of coverage of XRP worldwide has been enormously rewarding. 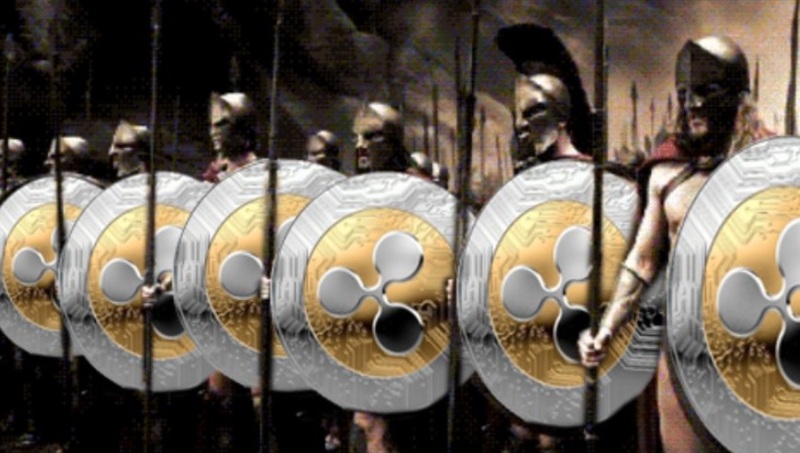 It's rare that I don't hear about XRP in the mainstream press now-a-days, and that's to be expected given it's prominence as the 2017 leader of crypto returns. Sometimes it's surprising to see the new personalities and famous faces that are now jumping on the XRP bandwagon. One of them was an unlikely source for XRP publicity: Richard Sherman. Richard Sherman is a football player (the "American" football) in the United States. He plays cornerback for the Seattle Seahawks in the National Football League (NFL). He's twenty-nine years old, and one of the highest-paid players in the NFL today.19 Oh, and he's an early adopter of crypto! 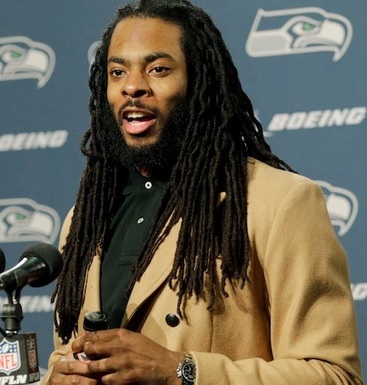 Like a subset of star athletes, Richard Sherman is regarded as highly intelligent. Known as a scholar-athlete, he graduated as the salutatorian of his high school with a 4.2 GPA. He graduated Stanford with a degree in communication. Is it any wonder that a stand-out individual like him is picking XRP as his favorite crypto-currency? I'd call that a public relations touchdown for Ripple.